UPC Games provided customers with a genre based games offering on TV. The games service was the first of its kind to target different audiences by listing TV games in 4 separate genres; puzzle, skill, family and sport. 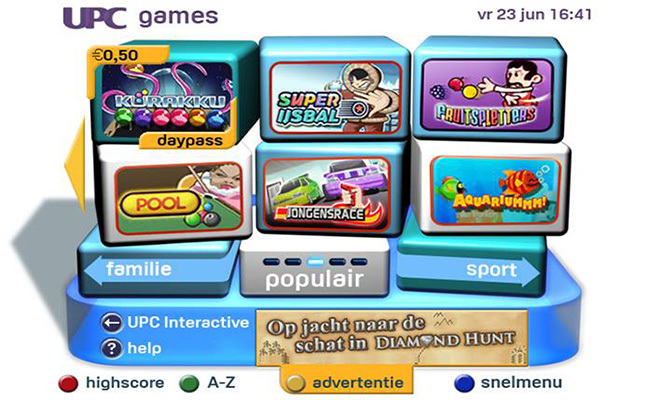 The main menu provided access to new and most popular games. At UPC I was the product, strategy and marketing lead for the games service in 5 countries. I also lead the acquisition of the content and worked with partners to market and grow the revenue of the service. Games were offered with a mixture of different payment models, such pay-to-play and day pass. A separate games service was offered providing access to casino style games.